Can Community Land Trusts Solve Baltimore’s Homelessness Problem? Vast numbers of Baltimore’s buildings are uninhabited. Could a new model of ownership put them in the hands of communities? In April, just hours after mourners gathered to pay their last respects to the body of Freddie Gray at Baltimore’s New Shiloh Baptist Church, the streets of his city went up in flames. The outrage at Gray’s death at the hands of police gave way on the day of his funeral to smoldering street scenes that seemed ripped from a past generation’s headlines. Now that the ashes and broken glass have been swept away, some locals are starting to think beyond just “cleaning up” the streets; they’re imagining a reclaimed urban landscape. The vibrant parcel may seem anomalous, but many hope to replicate it through the special type of development scheme that makes this space possible, a Community Land Trust (CLT). The basic concept is both intuitive and novel in a city flooded with so-called “abandoned” and “neglected” property. A land trust starts with the idea that land has inherent value. Plots are collectively owned, developed and governed by community members; individual residents apply to build or lease on the land under the community’s oversight. The nonprofit joint ownership structure encourages cost-controlled and inclusive urban planning. While rent controls and public housing are common policy instruments for keeping housing markets affordable, CLTs enable residents to make communal decisions on land use according to local needs. Though CLT’s are often geared toward supporting homeownership, to deal with Baltimore’s chronic urban crisis, activists hope publicly supported CLTs can provide a democratic platform for connecting the poorest residents directly with the land, so they too have a say in how housing is distributed. Amazing Grace’s commons are run by the Charm City Land Trusts, a local organization run by a board of community members. Other community gardens have cropped up based on the land trust model, several of which have been developed from formerly blighted plots, purchased and rehabilitated by the nonprofit Baltimore Green Space. The Charm City Land Trusts is now hoping to venture into residential housing development for local families, who have long suffered from both unaffordable rents and dilapidated neighborhoods. Dittman knows it’s a stretch—especially in an area that has been bled for generations by intergenerational poverty and draconian “broken windows” policing. The church is a rare safe space, he tells The Nation via e-mail, but “we live in a community that deals daily with the challenges of deep poverty, violence, overly aggressive policing, and trauma…. the rhythm of life is often interrupted.” Could the “sacred commons” ethos of place-based recovery be built into a rehabilitated house, designed specifically for, say, families who lost homes in the recession? The Charm City Land Trusts is preparing to close on their first residential property—a fixer-upper donated by a bank for rehabilitation. “We are wanting to transform the community tragedy of foreclosure into a moment of promise,” he says. Balancing public and private spheres, the CLT offers a collective alternative to the neoliberal “ownership society,” in which a public, democratically controlled entity finances and manages a property, in theory, for the public good. Though groups like Amazing Grace have revamped the idea to build green space, under the traditional homeownership-based CLT model, an individual home is privately purchased or sold, while land is leased from the trust. Property ownership is transferred at a modest “non-speculative” rate set by the Board, in order to keep the housing stock permanently affordable. As a political and economic institution, publicly held land might help balance a landscape pockmarked with both empty houses and homeless people. About 30,000 people in Baltimore cycle through homelessness over the course of a year, while about one in every 495 houses had undergone a foreclosure as of mid-2015—the second-highest rate in the country. Community organizations are pushing the Baltimore City Council to incorporate the land trust model into affordable housing plans—paralleling similar initiatives in Washington, DC, and Philadelphia. There are no concrete policy proposals yet, but residents are wondering why, with thousands of vacancies dotting Baltimore’s poorest neighborhoods, so many people have nowhere to live. To resolve that paradox of unaffordability and underdevelopment, labor and community organizations have explored the land trust model as a bridge between Amazing Grace’s garden path and the boarded-up eyesores strafing surrounding blocks. One potential resource is Maryland’s Affordable Housing Land Trust Act, which provides state support for land trusts devoted to staving off gentrification and preserving affordable housing. While the model is used in other areas of the state, there hasn’t been a political or social infrastructure for launching full-scale residential land trusts in Baltimore. But some grassroots campaigns are integrating the land trust concept into what they call a human rights-based development agenda. Peter Sabonis of the advocacy group National Economic and Social Rights Initiative, points out that with targeted social supports, CLTs have shown higher success rates in shepherding residents to home ownership than other home-buyer programs, like one-off tax credits. The challenge in Baltimore is connecting the housing crisis and the homelessness crisis, and addressing jobs, transportation, and schools simultaneously. The land trust model was founded on such communal principles; the first projects fostered plots for black farmers in rural Georgia besieged by brutal discrimination. Today the model is being revisited as a potential bulwark against gentrification in fast-growing communities. In disadvantaged urban landscapes like Baltimore, community land trusts, community gardens and other programs for restoring common space are giving teeth to the “right to the city” and “new urbanism” movements. About 30,000 people in Baltimore cycle through homelessness over the course of a year. But at a recent Baltimore city council hearing, community members talked not about the ideology behind land trusts and more about basic rights. 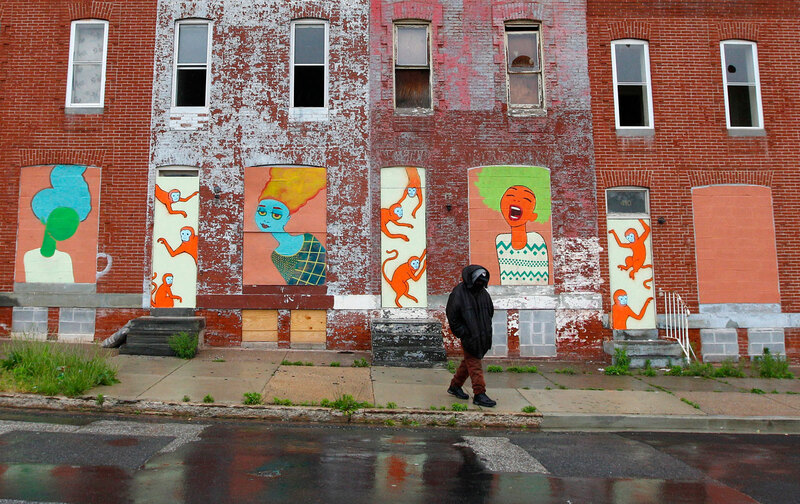 Freddie Gray’s own short life was profoundly impacted by Baltimore’s decaying housing stock. Before his body went limp in the police van, it was ravaged by lead paint flaking off the walls of his childhood apartment. As The Washington Post recounts, according to a 2008 lawsuit, Gray was one of some 93,000 victims of childhood lead poisoning across Maryland. Public health authorities have linked lead poisoning to an epidemic of behavioral and developmental issues. Though it’s impossible to know the exact effects of this damage on Gray’s development, the history of lead damage shows how the built environment’s dangers intersect with a neighborhood’s so-called broken windows. The region’s experiments in affordable housing have often ended just as painfully. Gray’s neighborhood, Sandtown-Winchester, was actually once a neoliberal laboratory for a “self-renewal” program around the time Gray was was born. But as Salon’s Joan Walsh reported, the philanthropy-fueled initiative, known as Community Building in Partnership Inc., pumped massive funds into construction and social service projects, but ultimately failed to deal with structural poverty, political disenfranchisement and mass incarceration. The recession choked off the vestiges of the botched rebirth, just a few years before Gray’s fatal encounter. Since Sandtown-Winchester’s implosion, activists have been rethinking urban development schemes. In 2010, United Workers led protests at a tourist center in the Inner Harbor neighborhood, charging the city with sinking public funds into development of a commercial zone that had brought primarily poverty-wage service jobs. Declaring the area an economic “Human Rights Zone,” the group demanded “fair development” and more democratic community control of development projects. Maybe a housing human rights zone could be cultivated from communally held land. But to start a land trust, you also need some basis of capital, and that’s been a development bottleneck that no one appears to have cracked yet in Baltimore. According to the Citizens Planning and Housing Association (CPHA), some 70,000 households spend more than half their income on housing, and the majority of those are poor, earning under 30 percent of the city’s median income (about $26,000 for a family of four). Tens of thousands of Baltimoreans languish on waiting lists for rental subsidies, yet they’re surrounded by some 16,000 vacancies citywide—the absurd product of a housing market that desperately needs permanent stabilization. That vision seems impossibly far from the despair that engulfed Sandtown-Winchester earlier this year, but April’s uprising briefly exposed the pain festering in the city’s social musculature: anger and frustration building up in toxic spaces. Community stewardship of “abandoned” land can channel that energy into space that might have little conventional “market value” but still possess a more intangible form of equity. Not every abandoned building is a rational investment opportunity, but nothing’s less rational than thousands of homeless people locked out of their own city. As they overlook their scarred streets, maybe Baltimoreans can find a radical road home, leaving the “ownership society” behind and entering a space that finally belongs to all.